It’s been a while since my last post to the Underground — part of this is due, I’m sure, to my observing a period of grief since the death of Peter R. Hallock, my friend and mentor for almost fifty years. But now I feel like writing again — I want to give a recap of the events surrounding the celebration of Peter’s life, and observe the turning of the seasons, both in the world and in the liturgical year. 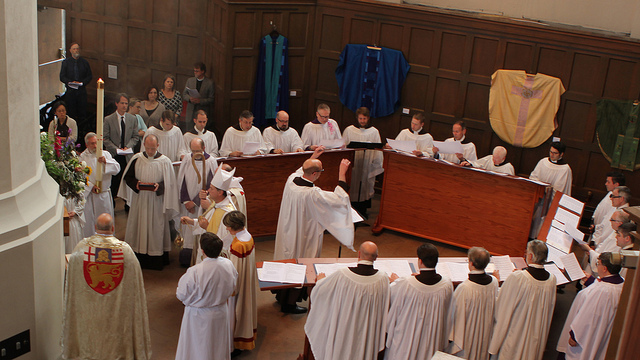 The weekend of May 17-18 was a very special time for all who were colleagues and friends of Peter, or who came to honor him at the burial rite on Sunday afternoon. The events have been excellently chronicled by Katherine Crosier in a number of articles on her blog, and I’ll provide links, so you can read about them in greater depth. They began with a party at Peter’s house in Fall City on Saturday, May 17 – a great time to share memories surrounded by all the familiar objects of his life. We were invited to take any books or CDs. My choice was Peter’s copy of Karen Armstrong’s The Battle for God, to which another friend, Ralph Carskadden (1940-2011) made reference in his sermon at St. Mark’s on the 50th anniversary of the Compline Choir. Peter’s Niche in the pillar facing the Compline Corner of St. Mark’s Cathedral. The burial service itself was an amazing event, with the Compline Choir and St. Mark’s Cathedral Choir providing the music, which was almost all by Peter Hallock (the event was recorded, and I will likely provide excerpts in future posts). The Dean of St. Mark’s preached an excellent sermon, “God is in the Numinous.” The most meaningful part of the service for me was the placing of a small box containing some of Peter’s ashes and other objects, in a niche in the large column by the Compline Corner. Soon it will be covered by a brass plaque which, after Peter’s name and dates, will read, “Mystic, Composer, Founder of the Compline Choir – ‘God is in the numinous. '” It will be a constant reminder of Peter’s presence from now on as we sing the service. 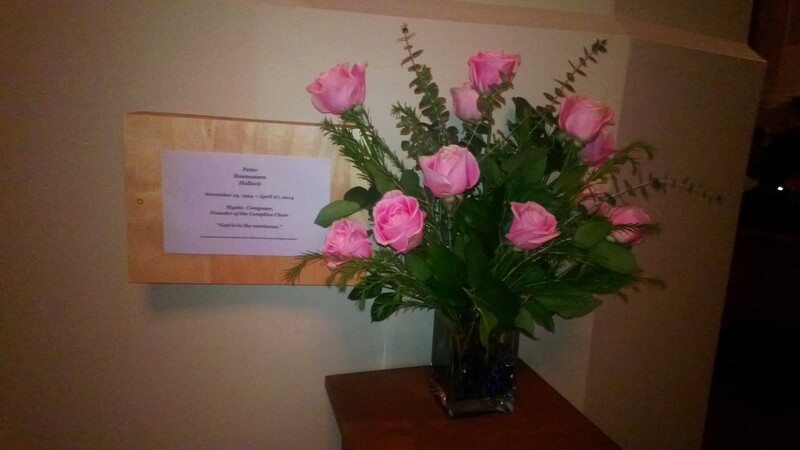 Choir members are taking turns providing flowers each week, next to the niche. After the burial service and reception, Compline was sung by the current choir, augmented by about 20 former members, some of whom had come from as far as Hawaii and Rhode Island to attend (read about the service here, or listen to the podcast). Peter’s death initiated the formation of the Hallock Institute, which will be dedicated to the propagation and performance of Peter’s music, and will “celebrate and share the Compline ethos” through workshops and other educational channels. I’m sure this will give much more shape and direction to the “Compline Underground” in the months to come. At the time of this writing, the summer season has begun, and the liturgical year has begun its longest season of Sundays after Pentecost, which stretch all the way to the end of November, when with Advent, the year begins again. Last Sunday was the Feast of the Holy Trinity, and the anthem we sang at Compline was “Great Lord of Lords.” I think the choir has never sounded as good on this piece – maybe the fact that our director had to sing one of the parts, and was leading from the side, and our view was straight toward Peter’s niche – whatever it was, I felt a tremendous sense of unity and purpose in our singing. Which makes earth, air and heaven to ring. Thy light beholds alike the bounds of depth and height. Amen.